Walking into Le Comptoir as a first-timer can be disorienting. With only a walnut counter and ten stools in a room the size of a wine cellar, it looks like a miniature coffee shop. The walls are bare, a coat hanger the only decoration. The kitchen? 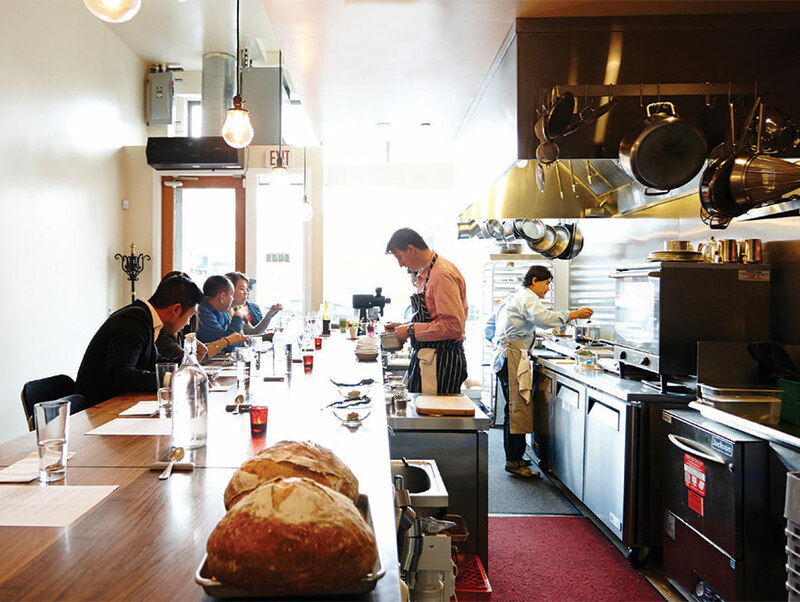 It’s little more than a row of portable equipment and a convection oven with a few dudes following the lead of chef Gary Menes, casually debonair in jeans and a neckerchief above the collar of his tattersall shirt. Menes has blended the focus of your better oma-kase restaurants with the smart operational elements of Trois Mec—online reservations, a fixed menu, a list of mainly French small-production wines—and set up shop in Koreatown’s Hotel Normandie, a brick building with Moorish windows that relaunched as a boutique in 2013. The novelist Malcolm Lowry is rumored to have finished Under the Volcano here in the 1930s. Today a revamped Cassell’s commands the corner, turning out tuna melts and prime beef patties. Downtown bar impresario Cedd Moses has opened a booth-filled boîte two spaces away. The low-key spirit of Le Comptoir (the name means “the counter”) reflects the atmosphere of the surrounding mom-and-pop eateries (you can get a terrific bean sprout-and-dry pollock soup across the street at Namsan), but it also feels invigorated by the two decades of haute training Menes brings to the pair of nightly seatings he holds. With Bill Evans on the sound system and Menes working the flameless induction burners, eating at Le Comptoir is less like being in a restaurant than in a great chef’s private studio. Everything about the venture seems personal, from the speckled hand-thrown bowls (a splurge from an Eagle Rock potter) to the big, crusty boule Menes leavens with a natural starter (one he’s maintained since seeing Nancy Silverton on a Julia Child show 20 years ago) to the cooking. While L.A. has lots of produce-driven restaurants, Menes goes farther, with a menu that is almost exclusively plant based. Which is not to say vegetarian. You can order a meat supplement—say, a pork belly from a hazelnut-fattened Oregon hog with green garlic puree or a generous slab of foie gras terrine—but you won’t miss the flesh. The chef grows much of the produce himself on an eighth of an acre at a community farm near his home in Long Beach. Mornings are spent plucking peas and gauging which head of Lacinato kale to pull. The potent freshness of these ingredients enables Menes to make all sorts of interesting connections. For example, I’ve had plenty of oeuf en cocotte in my life but none like this. 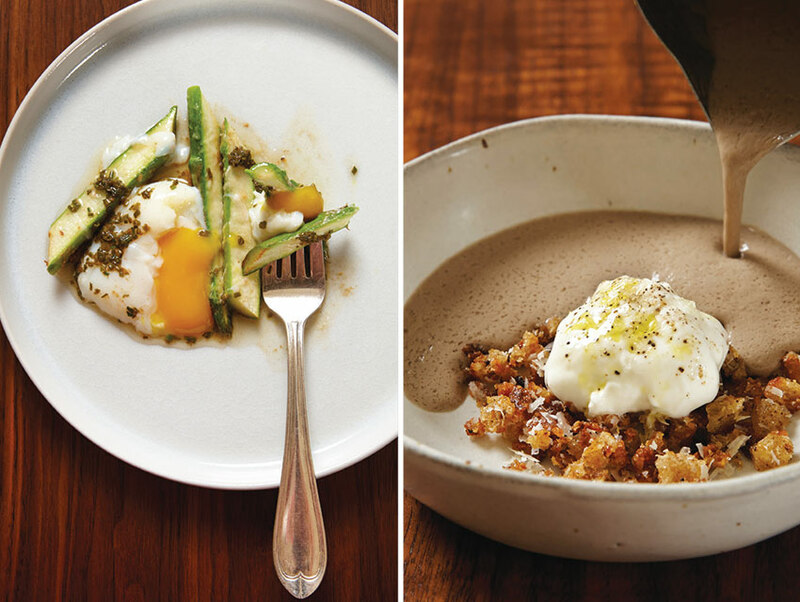 Menes cooks the egg in a cast-iron Staub ramekin, and when it starts to set, he sprinkles on shaved Regianno before giving the dish a hit of frothy thyme butter. But it’s the just-picked spears of lettuce he serves alongside for dunking—lovely Red Orach, russet Rouge d’Hiver, and supercrisp Deer Tongue—that transform the bistro classic into a delightfully incongruous dish, like a salad dressed with warm mayonnaise. 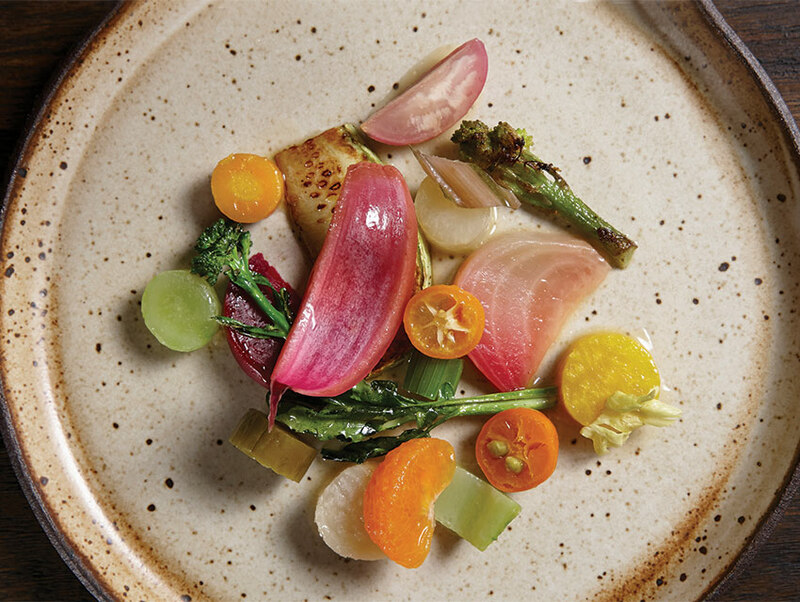 Even with something as generic sounding as the fruit and vegetable plate, he choreographs an exciting interplay between the crunch of the Fuyu persimmon and the pliancy of celtuce, the char of the roasted Romanesco cauliflower tip and the tang of the quartered calamansi (a citrus from the Philippines). In late spring he augmented the preparation with marrow zucchini. By early summer he’d woven in the natural sweetness of corn. Just about the only time I haven’t seen a connection between ingredients is with the flavorless truffles shaved over my friend’s tagliolini, a buttery $35 supplemental dish that was all the more disappointing for being offered in a place with such powerful produce. I was glad I stuck with the roasted butternut squash, an ample slice with wheat berries, preserved cherries, and toasted pumpkin seeds, the flavors combining to provide a sweet landing spot for a brambly glass of Anderson Valley Whitcraft pinot noir. Menes was raised in Long Beach, where his Filipino grandparents taught him an appreciation for the locally grown. His parents insisted he get a college degree (business, Cal State Dominguez Hills), but the hundreds of VHS tapes he’d accumulated as a teenager were of shows like Discovery Channel’s Great Chefs, featuring Daniel Boulud and Alain Ducasse. With no training, he walked into the back of the old Patina on Melrose in the early ’90s and landed a job under Michael Otsuka, who was heading a brigade that would include Josiah Citrin and Walter Manzke as line cooks. When Menes decided to apply for a gig at the French Laundry, he was startled by the level of the crew. “Those guys were like fighter pilots—the best of the best,” he told me over the phone. “I remember Grant Achatz looking up from his station, saying, ‘This is brutal.’ ” Menes wasn’t ready and said as much to Thomas Keller during his interview. Two years later he returned, working there for a year and a half, honing skills on the line and absorbing the Kellerian ethos of craft and service as spiritual discipline. Later there would be stints at spots like Palate Food + Wine in Glendale, Firefly in South Pasadena, and Marché in the Valley before he inaugurated Le Comptoir as a pop-up in 2011. At times the place still carries some of the “it’s the food that matters” aura of a pop-up, what with the spareness and the teeny staff. Now that the operation is permanent, it would be nice if the crew were quicker in offering a glass of wine when you take a seat—something to dull the edge after almost butting bumpers on 6th Street. But when the team is intently focused on tweezing petals to lay over the amuse-bouche, gripes like that soon appear petty. Once Menes or his main assistant, Randy Moles, jots down your order, it gets posted on the wall with gaffer’s tape. Then it’s down to business as you get a front-row view while Menes sears, slices, and sauces with the precise movements of a serious chef—not a motion wasted. Among his favorite techniques is depending on the lushness of dairy to frame his produce. He uses cultured crème fraîche and yogurt in two courses as well as a house-made ricotta for filling the mini ravioli in a third. So it’s good to see Menes go in another direction with his soups, ratcheting back on the cream and creating texture instead by straining vegetable essence through a tamis several times (over the months I’ve had cauliflower, Japanese sweet potato, button mushrooms). Using the sort of milk-frothing pitcher you might see at Starbucks, he pours the finished product into an asymmetrical bowl that has cheese-flecked fried bread crumbs at the bottom. When he makes tomato soup, the cheese in the garnish is particularly drawn out, like it’s the most urbane rendering of the timeless soup-and-sandwich combo. And although Menes uses butter in his sauces, he skips another traditional ingredient: animal stocks. Rather than rely on a highly concentrated demi-glace to accentuate a slice of New York strip (sourced by L.A.’s Belcampo Meat from cattle that graze at the foot of Mount Shasta), he underlines the beef’s quality with his spin on an Argentinean chimichurri: house-made red vinegar carrying whole parsley leaves, minced garlic, and chile flakes. For another course—a fricassée of mushrooms, snap peas, and charred romaine—he spoons on a pungent brown onion broth. In his cassoulet, the cooking liquid from lima beans supports a mix of favas, almonds, and apple slices that are cut and sautéed at the last moment to retain their freshness. A bigger kitchen might have executed that final step during afternoon prep, when any mistake, like burning the slices, could be more easily rectified. Delaying the moment produce meets the pan adds an element of wokhay—the immediacy of wok cooking—to the food, especially when it’s a thick, gorgeous stalk of Zuckerman’s Farm Delta asparagus. After the fifth course has been cleared away, Menes might use a torch to caramelize strawberry segments that will go with Meyer lemon curd and a hot sourdough doughnut hole. For those who’ve ordered the cheese plate, there’ll be slices of Hook’s ten-year cheddar and Rogue Creamery Blue. As the pace slows, an easy intimacy develops between the chef and his guests. “Why go from pop-up to permanent?” someone invariably asks. Stability, he answers. “How long will you be here?” The lease is ten years, he says with a contented look that seems to betray a touch of nervousness, too. You’d never know the clock is being eyed, but the next seating is in 20 minutes; there is work to be done. So, bopping his head to the quiet jazz, Menes turns to wipe down the burners.